When you’re first starting out, picking the best fishing paddle board looks daunting. With so many board styles, sizes, and accessory options to choose from, it’s a difficult task for even experienced paddleboarders. 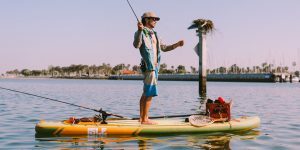 We’re going to boil it down for you and give you an idea of precisely which board, paddle, and fishing gear you need to take a serious plunge into the world of stand up paddle (SUP) fishing. With this information, you’ll have everything you need to go out and find the best fishing paddle board and start having fun on the water. 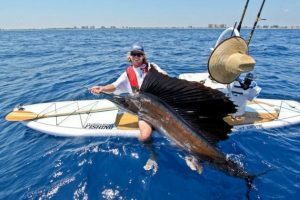 Buyer’s Guide – How To Choose the Best Paddle Board for Fishing? Picking the right SUP fishing board isn’t as hard as it might seem at first. Many designs will make an excellent fishing SUP board. 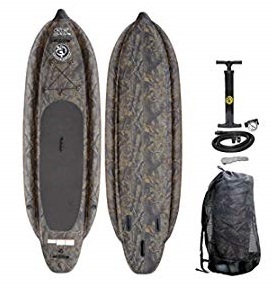 With a little thinking about how and where you plan to use it, you can easily pick out the perfect board for stand up paddleboard fishing. The primary things you’ll want to consider are the fishing boards available, the size of the paddle you’ll use, the board’s weight capacity, and any fishing accessories you may need. Paddleboarding has become an immensely popular activity in the last few years. As such, there is a paddle board built for every purpose and every paddle boarder. Besides fishing, paddle boards can be specially built for touring, racing, yoga, or surfing. Most boards are multi-purpose, but you will want to make sure your board is appropriate to use as a fishing board. Paddle boards can be grouped into two main categories: solid and inflatable. The best solid SUP for fishing is usually a touring board. 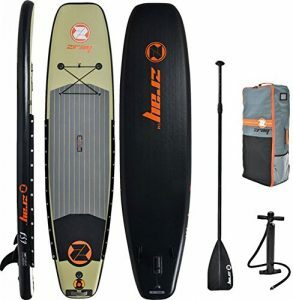 These boards feature displacement hulls and are thicker than other SUPs, which allows you to carry more gear. Remember that while longer and thicker boards may be more stable, they are less maneuverable than shorter boards. A balance must be struck between an appropriate load capacity and maneuverability for your type of paddling. 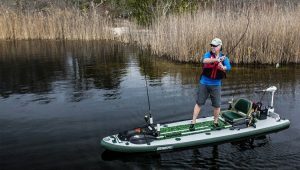 An inflatable paddleboard can make a great fishing board. The best inflatable SUP for fishing is one that can carry you and your gear and is hardy enough to handle rough usage. The main advantages of inflatable boards are portability and durability. They can easily be rolled up and carried in the trunk of a car. Inflatables are made of heavy-duty PVC vinyl and are puncture resistant. They are much hardier than hard epoxy boards, which can chip and scratch easily on rocky shorelines or if you knock them around while carrying them to and from the water. 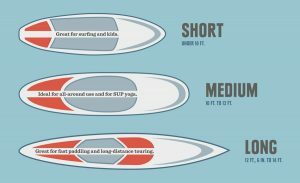 What Size SUP Paddle Should I Get? After you’ve chosen your SUP, your next big decision will be which paddle to use. Many SUPs come packaged with a generic paddle, and while it gets the job done, you may want to invest in a better paddle. If you are going to be using your paddleboard a lot, you’ll want to get a great paddle that gives you comfort and performance. Consider the size, length, and weight of the SUP paddle. As a stand-up paddleboarder, your height determines the length of paddle you should use. Many paddles are adjustable – a nice feature if you share your board with others. Another consideration may be storage: paddles come in one, two, or three pieces to break down for travel. If you purchase an inflatable board for easy travel, you will want to consider a three-piece paddle that breaks down as compact as possible. While length and size are important, the weight of the paddle is going to affect your paddling experience the most. Heavy paddles are a drag, and they cause fatigue and tire muscles quickly. The goal of a paddle is to move you and your board through the water efficiently, and this is harder to do with a heavy paddle. Paddles are made from aluminum, wood, fiberglass, and carbon. Each material has different weight characteristics and price points. Fiberglass paddles are a great starting point since they offer a great balance of low weight, high-performance, and a moderate price point. The weight capacity of your SUP is one of the main things you want to look for when shopping for a fishing board. With extra weight capacity comes greater stability and more room for fishing gear. Weight capacity tends to increase with longer, thicker, and wider boards. Touring style boards feature a displacement hull that is designed to displace water and tend to allow the most gear. These boards are usually identified by a pointed bow and a thicker midsection. They carry a lot of gear and are very stable, making them an excellent choice for paddleboard fishing. Keep in mind that the longer and heavier the paddle board, the less maneuverable it is. You’ll want to strike a compromise with a board that is big enough to carry you and your gear comfortably but also small enough to manage getting to and from your fishing hole. Another good choice is an inflatable SUP. These boards are the ultimate multitaskers. Since they are lighter than epoxy hard boards, inflatables tend to carry more weight and are more stable. Since a shorter board can carry the load, you can easily strike a balance with the weight capacity and maneuverability with an inflatable paddle board. Outfitting your new SUP for paddleboard fishing is the fun part. Some manufacturers offer special fishing packages for their boards to turn them quickly into fish hunting machines. Of course, these accessories are available separately, but you will want to think carefully about how they will attach to your board and how your fishing setup will look in the end.. Beyond the basic fishing and paddleboarding gear like rods, reels, and paddles – you’ll want to outfit your fishing platform for comfort on the water. You’ll need to have a place to store your gear and keep your catch. The most popular SUP fishing accessory is likely the cooler. 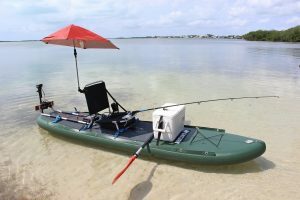 A good cooler that fits well on the paddle board and mounts securely gives you a place to keep your bait and catch, as well as provides a comfortable seat and even a casting platform. A rack is also a popular addition for paddleboard fishing. The rack provides a grab rail for stability, as well as a leaning post to provide leverage when reeling in the big one. Many racks also feature convenient rod holders and other accessories you’ll find extremely convenient while out on the water. Stand up paddle boarding (SUP) has become extremely popular since the beginning of the century. As new participates enter the sport, they try to answer the multitude of questions that may prevent them from enjoying themselves. Below find answers to some of the most asked questions when selecting the best paddle board. The Tower Inflatable SUP Paddle Board is designed (10’4” long and 32” wide) to provide supreme stability and balance. It has a weight capacity of 350 pounds. Perfect for beginners, this paddle board will meet all the needs of expert boarders. The Tower works great as a stand-up paddle board for fishing. The body is made of military grade PVC reinforced by industrial drop-stitch construction. This combination ensures the long-term durability of the board. Board cracks and dings are no longer an issue. The Tower inflatable is one of the best SUP on the market. 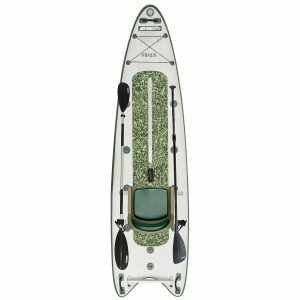 The Aqua Marina Drift Fishing Inflatable SUP is an ideal fishing stand up paddle board. It provides the feel of a hard board when fully inflated (10’ 10” long and 38” wide). With a thickness of 6”, this board delivers the stability you expect from an Aqua Marina product. The Drift also supports riders and fishing gear weighing up to 290 pounds. Made of military-grade material with double-wall drop stitch construction, the Drift is as durable as any paddle board on the market. Even with the listed shortcomings, the Drift is an excellent fishing paddle board. Unskilled and skilled riders will enjoy the stability and maneuverability this board provides. The Zray Inflatable SUP Paddle Board is an extremely versatile board. 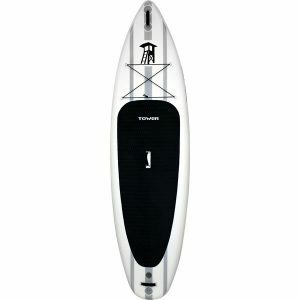 This top rated SUP has the feel of a hard board when fully inflated (length of 10’10” and width of 32”). It supports weight up to 330 pounds. With a thickness of 6”, the Zray provides good stability. Beginner riders can confidently take this SUP for a cruise. 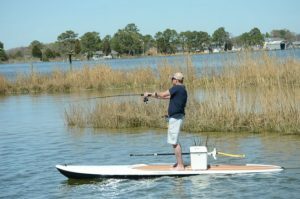 This board is the best stand up paddle board for fishing. By standing up, fishers gain better visibility of the fish and can virtually sneak up on fish without much noise. The 3-fin system (two fixed and one removable) provides optimal maneuverability. The California Board Company 11-foot Angler SUP is a good entry-level board for newcomers to the sport. It is a hard board (11’ long and 30” wide) with an inflatable price tag. Because it is slightly less than five inches thick, some stability issues will be encountered. The SUP has a weight capacity of 350 pounds. The SUP is made of five layers of Epoxy resin. The resin coats two layers of fiberglass cloth. This combination makes the board both durable and lightweight. Both novice and experienced riders will enjoy this board. The California Board Company developed this hard board to compete with lower priced inflatables. The SUP is compatible in that respect, but more experienced riders can find better options on the market. The Airhead Sportsstuff SUP is an inflatable built to perform like a fiberglass board. The double drop stitch construction provides that durability is not an issue. Overall, this SUP delivered what it promised. It provides a stable platform and allows fisherman to enjoy the experience. 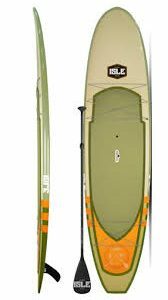 Beginner and intermediate paddler boarders will enjoy this inflatable SUP from Isle Sportsman. When inflated, the board is 11’ 6” long and 36” wide. It supports riders up to 320 pounds. To ensure high durability, Isle Sportsman uses a high-tech proprietary process machine (called Airtech Fusion Lite) to coat the drop stitch with a special seal and bonding layer. Then it fuses a machine laminated, higher density military grade PVC layer on top. You will find it extremely difficult to damage the fishing paddleboard. 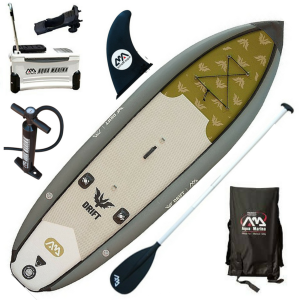 The Sea Eagle FishSUP (Deluxe package) is an excellent SUP fishing board. It inflates out to 12’ 6” long and 40” wide and support up to 350 pounds. With a thickness of 6”, this fishing SUP provides the stability needed to catch the big one (board specially designed for the fisherman). A large swallow tail was added to increase stability and maneuverability. Durability is not an issue either. The board is made of 1000 Denier reinforced drop stitch. 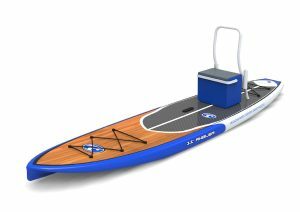 The Sea Eagle FishSUP (Start Up package) is made for stand up paddle fishing. It inflates out to 12’ 6” long and 40” wide and supports up to 350 pounds. 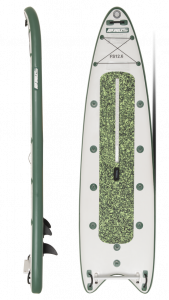 With a thickness of 6”, this fishing SUP provides the stability and maneuverability to access those tight fishing spots. The board is made of 1000 Denier reinforced drop stitch making the board durable. 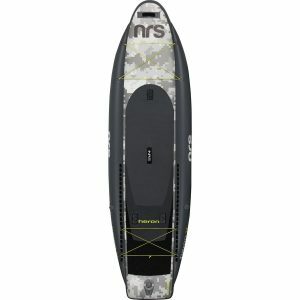 The NRS Heron Inflatable Stand Up Paddleboard is possibly one of the best inflatable SUP for fishing. This board is very stable with a thickness of 5” along with being 11’ long and 39” wide. Now imagine having dual outriggers that are 7” thick on the side. You now have an inflatable fishing paddle board that keeps you standing upright under any condition. Even inexperienced riders will feel safe onboard. The Heron is also built for durability. It is made of heavy-duty PVC drop-stitch with double sidewall construction. The SUP also inflates to 20 PSI (truly a hard board feel). 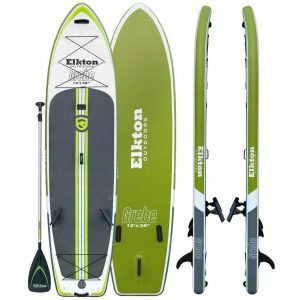 The Elkton Outdoors Grebe is considered one of the best inflatable SUP boards around. When inflated, the board is 12 feet long and 3 feet wide and able to carry up to 280 pounds. Made of a double layer of PVC and with a drop stitch construction, this board is built to last. No need to worry about punctures, scratches, or leaks. 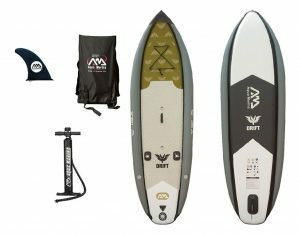 This board is the ideal inflatable fishing SUP. It has pre-installed Scotty Mounts (can personalize your fishing trip by attaching down-riggers, a GPS system, additional fishing rods and/or anchor). The Grebe has a front and rear bungee used for storage. An experienced fisherman will enjoy aking an ice chest, tackle box, and a personal floatation device with such a flexible storage system. An excellent paddle board for fishing. Its durability, stability, and overall performance place this board near the top of the class. Question #1 – What length sup do I need? Your weight and paddle boarding experience will decide what length is ideal for you. You should look at the board’s volume instead of just length. The volume is determined by the width, length and thickness of the board. The volume directly relates to the board’s stability. Beginner paddlers will want a board with more volume to provide greater stability and support heavier weight. As your skill, balance, and strength improves, you can downsize to a board with less volume. Question #2 – What size SUP paddle should I get? Take the rider’s height and add 9-10 inches. For example, if you are 6 feet tall, you should get a paddle that is around 81-82 inches. Question #3 – Are all paddle boards inflatable? No, all paddle boards are not inflatable. You also have the option to buy a ‘rigid’ board – typically made of fiberglass. For example, the California Board Company 11’ Angler Fishing SUP is a rigid board. The difference between fiberglass SUP boards and inflatable SUP boards is performance. Inflatables try to imitate fiberglass. 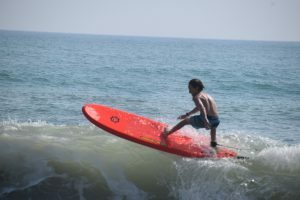 The style of board riding determines the overall performance of the board. Question #4 – Can you use a surfboard as a paddleboard? No you cannot use a surfboard as a paddle-board. A surfboard doesn’t have enough volume to support the rider on still water. Surfboards are designed narrower than paddle-boards and are made for moving water. The paddle-board is designed for buoyancy in still water and to support a person standing. Question #5 – What do you wear for paddle boarding? Question #6 – How much weight can a paddle board hold? The width of the paddle board pays a major factor in determining how much weight it can hold. Generally speaking, a wider board has more stability.Boards with higher weight limits are normally wider. You will also notice that wider boards tend to be longer. Longer, wider boards provide better stability which is important in supporting higher weight. Conclusion – The Winner by Technical Knockout is ….. The best fishing paddle board is the Tower Inflatable 10’4” SUP. Even though it was the smallest, this SUP is able to carry the most (350 pounds). It is able to accomplish this feat without losing its ability to provide an extremely stable platform for fisherman. All evaluated paddle boards will serve admirably as a fishing board. Each product is durable, and provides an unwavering platform. Every level of paddle board rider will enjoy their experience on these devices.